Harvard’s Office of Technology Development (OTD) has worked closely with the Loncar Lab on the formation of a startup company, HyperLight, that intends to commercialize a portfolio of foundational intellectual property related to this research. Readying the technology toward the launch of HyperLight has been aided by funding from OTD’s Physical Sciences & Engineering Accelerator, which provides translational funding for research projects that show potential for significant commercial impact. Fiber-optical networks, the backbone of the internet, rely on high-fidelity information conversion from electrical to the optical domain. The researchers combined the best optical material with innovative nanofabrication and design approaches, to realize, energy-efficient, high-speed, low-loss, electro-optic converters for quantum and classical communications (Image courtesy of Second Bay Studios/Harvard SEAS). 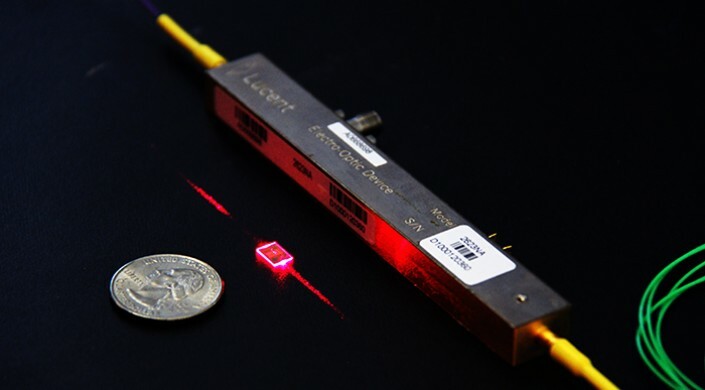 Lithium niobate modulators are the backbone of modern telecommunications, converting electronic data to optical information in fiber optic cables. However, conventional LN modulators are bulky, expensive and power hungry. These modulators require a drive voltage of 3 to 5 volts, significantly higher than that provided by typical CMOS circuitry, which provides about 1 volt. As a result, separate, power-consuming amplifiers are needed to drive the modulators, severely limiting chip-scale optoelectronic integration. Lithium niobite is considered by many in the field to be difficult to work with on small scales, an obstacle that has so far ruled out practical integrated, on-chip applications. In previous research, Loncar and his team demonstrated a technique to fabricate high-performance lithium niobate microstructures using standard plasma etching to physically sculpt microresonators in thin lithium niobate films. 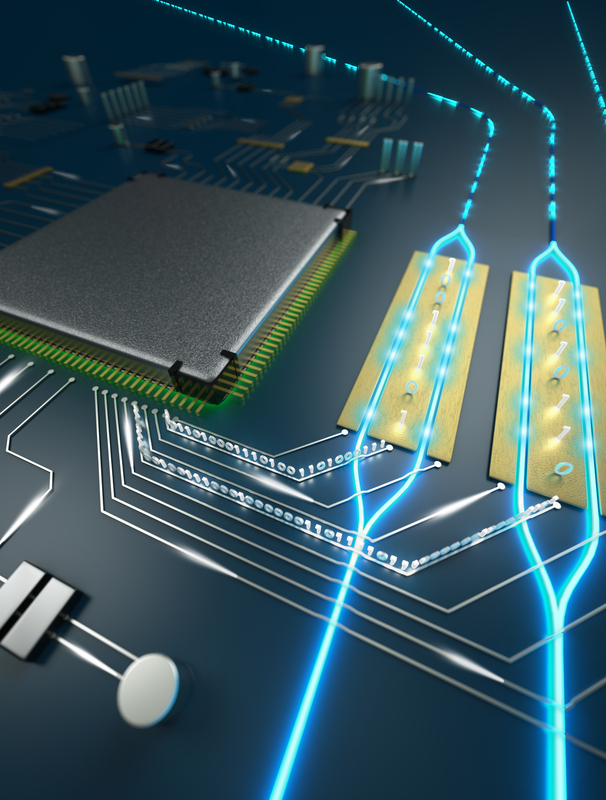 Combining that technique with specially designed electrical components, the researchers can now design and fabricate an integrated, high-performance on-chip modulator. This research was co-authored by Xi Chen, Maxime Bertrand, Amirhassan Shams-Ansari, and Sethumadhavan Chandrasekhar. It was supported in part by National Science Foundation and the Harvard University Office of Technology Development’s Physical Sciences and Engineering Accelerator Award. Device fabrication was performed at the Harvard University Center for Nanoscale Systems (CNS), a member of the National Nanotechnology Coordinated Infrastructure Network (NNCI), which is supported by the National Science Foundation. Conventional lithium niobite modulators [right] are the backbone of modern telecommunications but are bulky, expensive and power hungry. 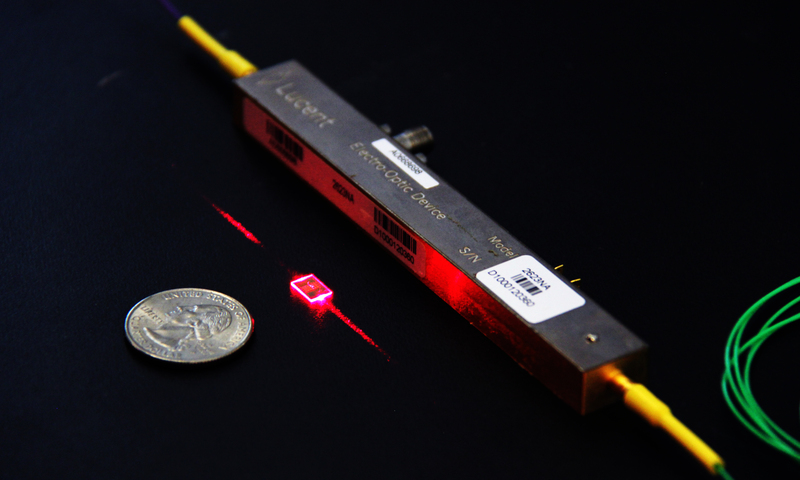 This integrated, on-chip modulator [center] is 100 times smaller and 20 times more efficient.